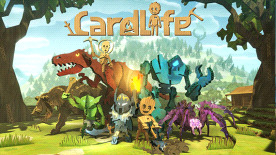 CardLife is an early access survival game, set in a world constructed entirely from recycled cardboard. Using the unique Connect the Dots (CTD) crafting system, almost everything within the world is editable. Explore, build, fight, and survive as you embark on your very own cardboard adventure! Using the CTD system, almost everything you can craft can be hand-drawn using a mouse or even a tablet. A character with an octopus for a head? A house made of abstract shapes with no roof? If you can imagine it, you can build it. User Generated Content (UGC) has always been at the core of Freejam’s ethos, and CardLife is no different. A science fantasy setting brings together a huge range of genre staples. A towering mech battling a rampaging dragon, weaponized vehicles facing down a pack of goblins, or laser rifles vs demons - nothing is impossible! Take your place in the cardboard community. Will you be a hunter? A merchant? A bandit? The world is your cardboard oyster. Shared building system allows players to construct huge, complex projects as a part of a team. Will you occupy a lonely stronghold atop a mountain? Or join a bustling city at the centre of the world? The game is just the beginning - CardLife isn’t just a game, but a platform. We actively encourage modding, and the game is easily accessible for modders to put their own spin on the world. ‘Official’ servers will provide the core CardLife experience, but we’re excited to see what the community can come up with!